First, a few words about the companion. 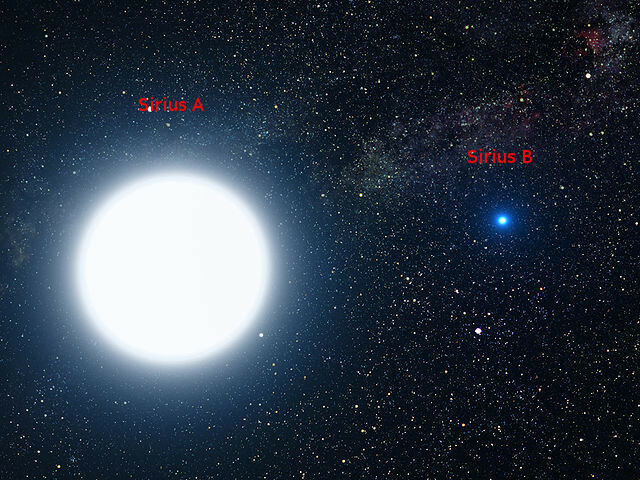 While Sirius A, the main component, is a large white star twice as massive as the Sun, Sirius B, the companion, is a white dwarf, about as massive as the Sun, but very small - about the same volume as the Earth. Around 120 million years ago, Sirius B was a large white star 5 times as massive as the Sun, but it has since passed through the red giant phase, and it's now the dead remnant of a formerly active star. Sirius B is currently not generating any new heat, as the fusion reactions in its core have stopped. It is steadily cooling down, a process that will take a very long time, since it's still pretty hot as of now: 25,200 K.
Basically, Sirius B is the white-hot dead body of a formerly large and very active star. While B is twice as hot as the primary (Sirius A), its very small size makes it much less bright. 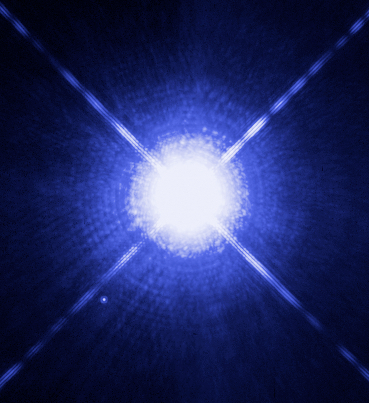 Sirius B's luminosity is about 10,000x lesser than Sirius A's. The two stars, the main component and the companion, orbit each other at a distance of approximately 20 UA (about the same like the distance between Sun and Uranus). 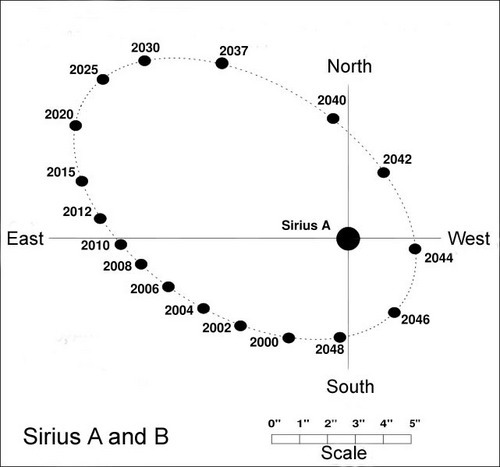 As a result, when observed from Earth, Sirius B appears to describe an ellipse around Sirius A, with a period of 50 years. Seen from Earth, the separation between Sirius A and B varies between 3 and 11 arcsec, on this 50 year cycle. Currently (2013), their separation is relatively large and will continue to increase until the early 2020's. Now is a good time to attempt an observation of Sirius B. But you have to follow certain rules, since this is not an easy target. This is a double star, with pretty good separation, but with a VERY large difference in brightness between components. Based on separation alone (3 ... 11"), it should be an easy double to split. But the brightness imbalance is staggering. Sirius B is often lost in Sirius A's tremendous glare. Special measures have to be taken to make B visible. If you're an experienced astronomer, you can probably skip some of the following recommendations, as they are just the usual performance-related tweaks for such observations and you know all this stuff already and you apply it as a matter of daily routine. But if you're a beginner, keep reading. In any case, do not worry. Sirius B is definitely visible even in a small amateur telescope throughout the 2010's, 2020's and 2030's. A good 100mm (4") scope or larger should split it in the upcoming years. You can do it, just play by the rules, and be persistent. You will likely not succeed on your first attempt, or on your second. But keep trying, and eventually you'll see it. If you live in the northern hemisphere, in the temperate zone, the best time to attempt observing Sirius B is in winter, January and February for the most part. This is when Sirius is at its highest in the sky at a convenient early hour. December is also fine if you don't mind staying up late, or November if you're basically an owl. It is important that the star is not too low in the sky, as seeing (turbulence) becomes much worse close to horizon, and seeing is absolutely crucial for this observation. At the 1st of February, you should be outside and already observing around 10pm. New Year's Day, the best time (when Sirius is at the highest point) is around midnight. The 1st of March, the best time is 8pm. Come April 1st, Sirius already begins to descend after sunset, so the best observational season is coming to an end. So, around the ideal time, go outside and look South. That very bright white star not too high in the sky is Sirius. 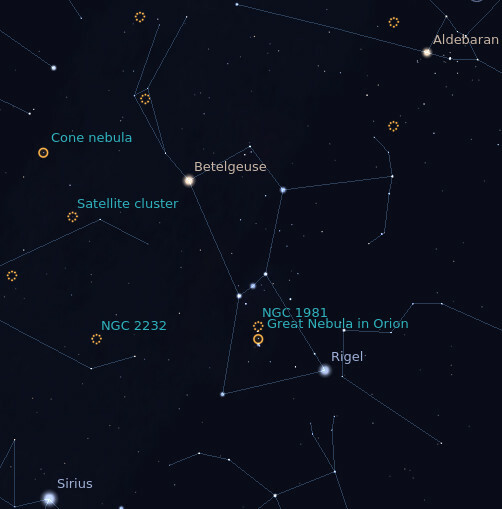 To its right (West), the great constellation of Orion is also visible, with bright red Betelgeuse for its "head", then the "belt" of three stars, then white Rigel at the "foot". What in astronomy is called "seeing" is known as turbulence by most people. Seeing (or air turbulence) blurs the image whenever you're attempting a high-resolution observation from Earth. It depends on the weather, location, and a number of other factors. It gets better sometimes, or worse. It is predictable to some extent. Choose a location nearest your place. Look at the third row in the chart, the one called "Seeing". When the chart is dark blue, that means good seeing. When the chart is white or light blue, seeing is predicted to be bad. Excellent seeing is absolutely crucial to this observation. It is the most important factor. Seeing that would be considered "pretty good" for other targets (such as Jupiter), simply doesn't cut it for Sirius B. To see this double star, nothing short of excellent seeing will work. Now, even if the seeing forecast is not perfect, but merely "good", you should still attempt an observation. There are brief moments sometimes when the air becomes very still even during more vigorous turbulence, and that's enough to get a short glimpse of Sirius B. But if the forecast is bad, there's probably no point in trying. Is the primary mirror clean enough? If your telescope is an open reflector (such as a dobsonian), dust accumulating on the primary mirror will increase light scattering. If you have cleaned the mirror in the last few months, then feel free to ignore this part. But if it's been a year or more since the last mirror clean-up, it's time to give it a bath. Be very gentle, and actually use the sense of touch to detect when you hit a dust mote lodged on the surface, and avoid dragging it across. Or use cotton balls if your fingers are less sensitive and you're afraid you'll scratch the mirror - but apply almost no pressure with the cotton. At the end, rinse it with plenty of distilled water, then leave it alone and don't touch it with anything afterwards. Since it's recommended you do this procedure once a year, perhaps it's a good idea to schedule it in early January, before you start hunting for Sirius B. Are the eyepieces clean enough? Use high-concentration alcohol (90% or better), and make sure the Q-tips are not soaked; if the Q-tip is just a bit wet, that's when cleaning is most successful. If the Q-tip makes a puddle of alcohol on the lens that persists for a long time, you're using too much liquid. Collimation is a vast topic, you could literally write a whole book discussing nothing but collimation, so keep learning and apply what you learn. Is the telescope cooled down? Even if you don't have a mirror fan, at least take the scope outside 1 hour before you start the observation, and let it cool down to ambient temperature. This should be enough to reap most benefits of thermal equilibrium. Seeing is great, Sirius is high in the sky, the telescope is in perfect shape - now it's time to look at Sirius, right? Not so fast. 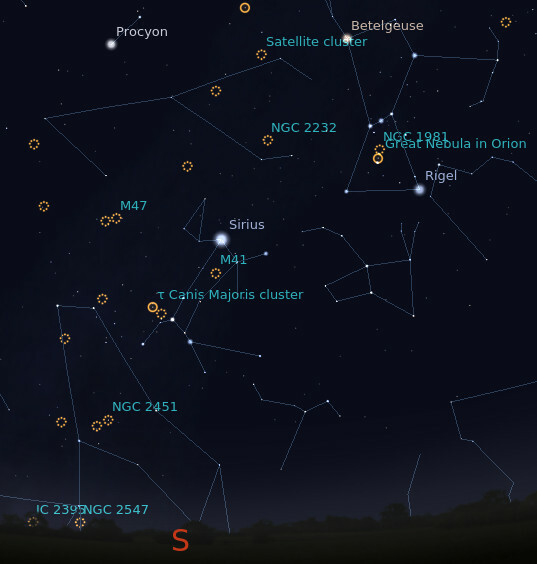 Before that, take a look to the West (to the right) of Sirius, and observe the large constellation of Orion. Betelgeuse is on top, bright and red. In the middle, there's the "belt" made of 3 stars. Then at the bottom there's Rigel, a bright white star. Rigel itself is a double star. The separation between Rigel A and B is currently (2013) about the same like the separation between Sirius A and B. Except the brightness difference between Rigel A and B is much less than the difference between Sirius A and B, which makes Rigel a much easier double to split. So grab a high power eyepiece, plug it into the scope, and point the instrument at Rigel. You'll see a bright white star, and nearby a much smaller star, which is supposed to be white but looks quite yellow to me. Try to memorize the distance between Rigel A and B, because that's the current distance between Sirius A and B (in 2013 at least, and slightly increasing in the next few years). If you can't see Rigel B, either seeing is so bad, or your scope is so out of whack, there's no point to even try to see Sirius B. Okay, time to actually describe the observation of The Pup. You should use very high magnification. Forget what you've heard on forums or from word-of-mouth about "magnification limits"; just plug in a strong eyepiece. For a 150mm (6") scope, 300x is not too much; for a 200mm (8") scope, up to 400x; for a 300mm (12") scope, up to 600x. 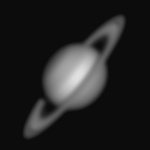 Try the highest magnification available, then back off a little if things are too fuzzy. You should not use less than half the magnifications indicated above - in other words, for a 200mm (8") scope, stay between 200x and 400x. Point the scope at Sirius, turn off tracking (if your scope has it), and let the star drift across the field. Sirius B is currently due east from A, so it should be trailing the primary star, following the primary almost exactly on the same trajectory. Over the next years, it will move north a little and won't trail Sirius A quite exactly behind, but a little off to the side. But nowadays B should be right behind A as both of them are drifting across the field in a non-tracking scope. A comfortable chair helps you relax and breathe slowly. Keep looking at the primary star and be mindful of the surrounding area trailing the star as it drifts across the field. There will be a lot of light scattered from the primary, making it hard to see anything in the vicinity. Just relax and keep watching. Sometimes the eye is covered in excess fluid (tears, basically) which blurs the image. Back off from the eyepiece a few mm and blink slowly and firmly a couple times (but don't squeeze it shut too hard), then resume. In theory, Sirius B should be just outside the bundle of shimmering brightness centered on Sirius A, but being pretty weak it's hidden by the tremendous glare from the primary. Once in a while, something will coalesce out of nothing in that area, and you'll see the unmistakable round pattern of a star. Even in good seeing, it will wink in and out of existence. Or you'll see it for a few moments, then it will vanish again for a long time. Do not confuse it with a diffraction or seeing artifact from the primary; stars are round, whereas artifacts are typically more linear or oddly-shaped. Only when seeing is very VERY good will you be able to see Sirius B for extended periods of time. Usually it's more elusive than that. When your eyes are tired, take a break, or observe the Great Orion Nebula nearby. Or look at Rigel A/B again and memorize the distance between them. Then get back to hunting Sirius B. If this is the first time you're attempting this observation, and you fail, well, that's normal. Try again tomorrow. And again. It's pretty hard to catch just the sort of perfect seeing required to see this star, so persistence is an important ingredient in the recipe. Perfect seeing, a telescope in perfect shape, high magnification, and persistence: that's how it's done. 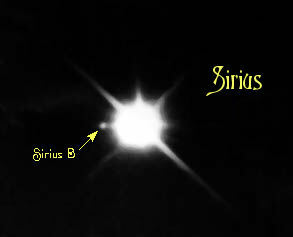 This is how the Hubble Telescope sees Sirius A and B. The Pup is that tiny dot of light near the bottom-left spike. This makes it quite clear why Sirius B is so hard to see in ground-based telescopes.